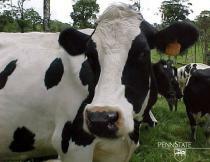 Methane - a major greenouse gas - comes from cow belches and farts. According to climate change site Earthsave, "Methane is responsible for nearly as much global warming as all other non-CO2 greenhouse gases put together. Methane is 21 times more powerful a greenhouse gas than CO2. While atmospheric concentrations of CO2 have risen by about 31% since pre-industrial times, methane concentrations have more than doubled." However a scientist at the Penn State Department of Dairy and Animal Science in the USA has found that feeding cattle oregano produces a decrease in methane emissions by 40%. In a series of laboratory experiments and a live animal test, an oregano-based supplement not only decreased methane emissions in dairy cows by 40 percent, but also improved milk production, according to Alexander Hristov, an associate professor of dairy nutrition. "Cattle are actually a major producer of methane gas and methane is a significant greenhouse gas," Hristov said. "In fact, worldwide, livestock emits 37 percent of anthropogenic methane." (which is methane produced by human activities like agriculture). Methane is a natural product of the digestive processes of animals such as cows and other ruminant like sheep or goats. Reducing their emissions would be beneficial in the struggle to diminish global warming.